After 20 years as the St. Louis Rams, the NFL team left the Missouri market earlier this year to become the Los Angeles Rams. 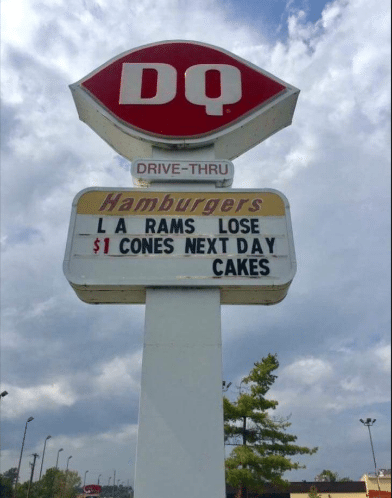 As a die-hard Rams fan, Arnold, Missouri Dairy Queen operator Ashley Narzinski, used the move to share some sweet revenge with St. Louis Rams fans. Throughout the 2016-17 season, each time the LA Rams lose a game, customers can get $1 discount cones the day after each loss at the location on Richardson Road–with a portion of the proceeds going to their local Children’s Miracle Network Hospital. I was looking forward to a donation for CMN today Sept 24 2016. Someone in St. Louis MO tried to get a Flea Market on the grounds of Sams Club in Wentzville, MO. She passed out flyers saying looking for Vendors just want a donation. Apparently She didn’t have permission, a permit or anyone there that new of her. As a non-profit Corp, do you think your group needs to take some control to curb this kind of False advertising in your name and Sam’s Clubs name? Previous post: Children’s Miracle Network Hospitals Raise Funds and Awareness for Local Children’s Hospital.